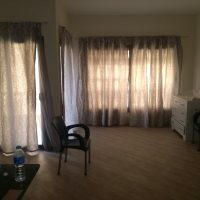 Unfurnished and well maintained 2 bed roomed 1st floor apartment in Golf Heights in Nabq, Sharm el Sheikh. 95 m2 with air conditioning, parking space and a balcony. Golf heights boasts of an 18 hole golf course, swimming pools and lush green scenery located in one of the most up and coming areas of Sharm el Sheikh. In close proximity to the nature reserve as well as the crystal clear waters of the Red Sea Golf Heights is a perfect place for those golf loving divers who also like a lot of nature. Golf heights is a quiet oasis in the desert. Unfurnished ready for you to put your own style into the place.